I am delighted to say the hairy footed flower bees are back! They have survived the winter in the strawberry pot for the 3rd year. A lucky shot of the male with his gorgeous hairy feet. He was sleeping in the sun by the back door. The little black females are around too very noisy and very busy. Many other bees are out and about. 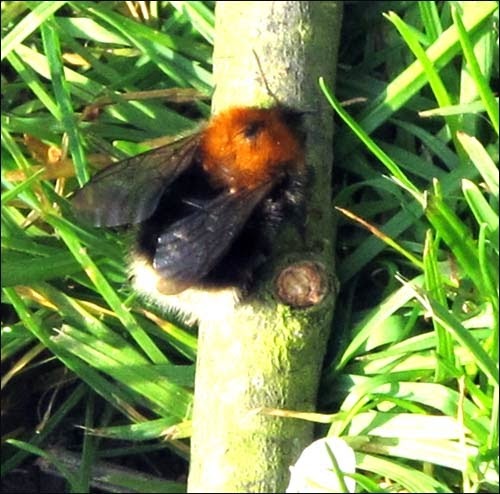 I just spotted a Tawny mining bee very new and very russet red gorgeous. It is lovely to see them. Anthophora plumipes The Hairy Footed Flower Bee. And in the last two weeks I have been on a couple of short courses. A very good lino workshop about 4 colour overprinting with Kevin Holdaway and last weekend an egg tempera workshop at Wysing Arts with Sohelia Sokhanvari. Both were excellent. Many years ago egg tempera and pen and ink were my favourite media. Then commercial life got in the way. But going back to this again I realise how much I really love working with egg and pigments.. Hmmm .. yes .. I may well do some more. We also experimented with making various kinds of inks. What I like so much about all this is that the materials are quite humble and simple. You can make paints and inks from many things found around the house and garden. I started the tempera study of the stone on the last afternoon of the class and finished it at home today. Just 5 pigments and one egg yolk and some water .. and a 00 brush. Almost finished study 4 x 2.5”… not quite there but they never are. What you can’t see of course it the beautiful sheen that the egg binder gives and the complex surface. It is really nice stuff to work with!